In the past, failed attempts to find evidence of such a cusp have focused on looking for the bright burst of X-ray glow that sometimes occurs in black hole binaries. 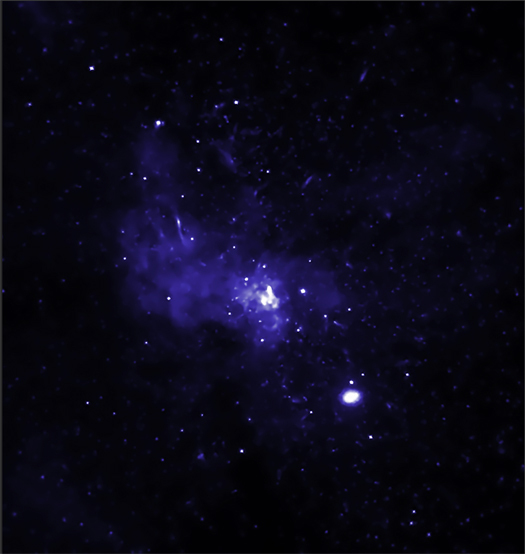 “It’s an obvious way to want to look for black holes,” Hailey said, “but the Galactic Center is so far away from Earth that those bursts are only strong and bright enough to see about once every 100 to 1,000 years.” To detect black hole binaries then, Hailey and his colleagues realized they would need to look for the fainter, but steadier X-rays emitted when the binaries are in an inactive state. Hailey and colleagues turned to archival data from the Chandra X-ray Observatory to test their technique. They searched for X-ray signatures of black hole-low mass binaries in their inactive state and were able to find 12 within three light years, of Sgr A*. The researchers then analyzed the properties and spatial distribution of the identified binary systems and extrapolated from their observations that there must be anywhere from 300 to 500 black hole-low mass binaries and about 10,000 isolated black holes in the area surrounding Sgr A*. Hailey’s co-authors on the paper include: Kaya Mori, Michael E. Berkowitz, and Benjamin J. Hord, all of Columbia University; Franz E. Bauer, of the Instituto de Astrofísica, Facultad de Física, Pontificia, Universidad Católica de Chile, Millennium Institute of Astrophysics, Vicuña Mackenna, and the Space Science Institute; and Jaesub Hong, of Harvard-Smithsonian Center for Astrophysics.